The U.S.-led coalition carried out strikes following an "unprovoked attack" on a SDF headquarters. The U.S.-led coalition in Syria killed an estimated 100 pro-regime fighters under Bashar Assad in Syria on Wednesday, according to the Coalition. 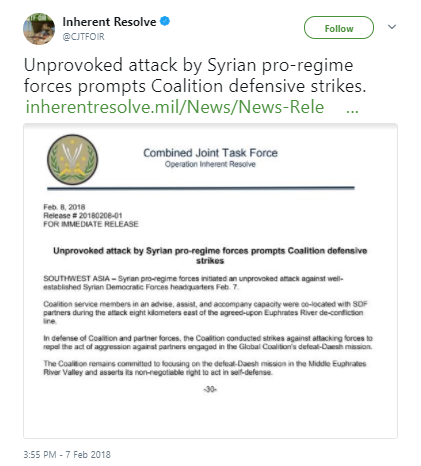 The strikes were carried out in self-defense, according to officials, who said the strikes were conducted after 500 pro-regime troops “initiated an unprovoked attack” against a Syrian Democratic Forces (SDF) headquarters where Coalition service members were located. The attack on the headquarters appeared “to be a coordinated attack on Syrian Democratic Forces approximately 8 kilometers east of the Euphrates River de-confliction line in Khusham, Syria,” Col. Thomas Veale, a public affairs officer for the Inherent Resolve Soalition, told Military Times. The pro-regime troops used mortar fire, artillery, and T-55 and T-72 main battle tanks with support from multiple-launch rocket systems to carry out the attack. Roughly “20 to 30 artillery and tank rounds landed within 500 meters” of the headquarters before the U.S.-led coalition carried out strikes in self-defense. No U.S.-led coalition forces were injured in the attack, but one SDF member was wounded. Khusha is five miles east of the de-confliction line that separates Russian-backed and U.S.-backed forces in Syria. “We also cannot speculate on the exact make-up of the Syrian pro-regime forces who conducted the attack at this time,” Veale said. The U.S.-led coalition said it was aware of a pro-regime build-up over the past week and informed Russia of that build-up. There are roughly 2,000 U.S. troops operating in Syria, mostly with SDF forces fighting ISIS.